Shopee Philippines unveiled the top performing brands in their platform for 2018 and Xiaomi topped the electronics category. During the influx of sales during 2018, a lot of people used Shopee to get the things they need and want. Shopee Philippines recorded around a 300 percent increase in orders for the electronics category in 2018. This made the electronics as one of the top 3 categories on the online shopping platform. These numbers came from the number of official brand stores now on Shopee Mall and the launching of Shopee Gadget Zone which is a dedicated portal featuring "Lowest Price Guaranteed" deals on tech products. 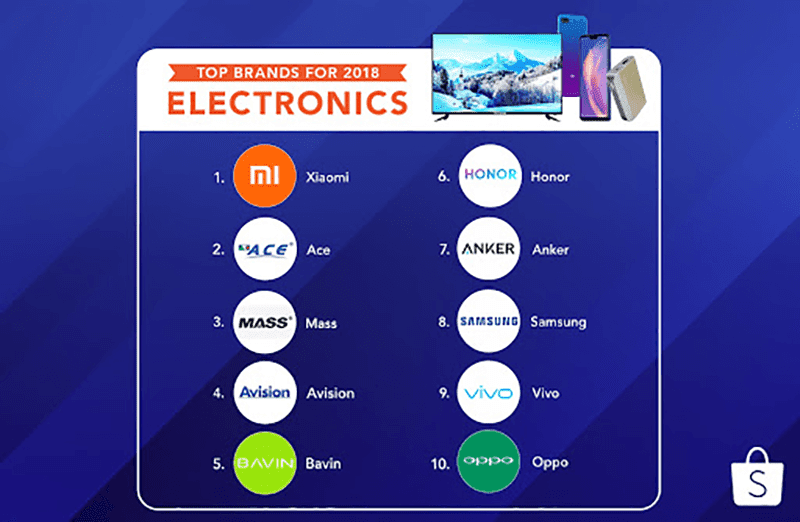 At the end of 2018, Xiaomi came out on top of the electronics brand. Xiaomi got out of the gates strong during their debut as the Redmi 5 got sold out in less than a minute during their first flash sale in April. "Xiaomi" was searched around 900,000 times on Shopee Philippines proving how popular it is. It is also helped by the POCOPHONE F1 which was sold out in 16 minutes during the Shopee 11.11 sale. TV brands such as Ace, Mass and Avision came in positions 2, 3 and 4 respectively. Bavin made it to the top 5 as well while Honor, Anker, Samsung, Vivo and OPPO rounds up the list.